Downtime occurs more often than most businesses like to admit. In fact, according to studies by the Aberdeen Research Group, the average website is out of business 8 days a year. This makes for 192 hours of 500 error messages from any given site, resulting in Internet users frequently experiencing feelings of anger, stress, and animosity – not exactly the customer experience businesses tend to aim for. Although downtime is difficult to avoid altogether, limiting its impact is feasible. In addition to being transparent about downtime and monitoring your site so that you can be alerted of issues as quickly as possible, having a humorous, clever, or visually appealing 500 error page may help to soften the blow when your site is unavailable. Although the ultimate goal is that users will never see your 500 error page, in the case that something does go wrong (because something will go wrong), it can’t hurt to give frustrated users something pretty to look at as they frantically click the refresh button in hopes of gaining access to your site. To recognize sites that have attempted to make the downtime experience slightly more bearable, we’ve compiled a gallery of our 15 favorite 500 error pages (in no particular order) for your viewing pleasure. If your business has an awesome error page that hasn’t been included, or if we’ve left someone out, feel free to let us know. We’d love to hear your comments! 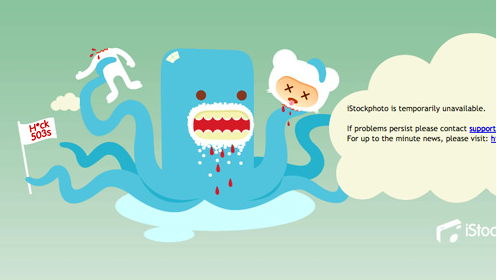 For more diversion, check out Mashable’s 35 Entertaining 404 Error Pages.